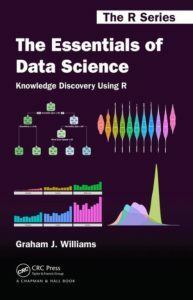 A Survival Guide to Data Science with R – using templates to come up to speed and maintain your data science competencies. See also The Essentials of Data Science web site for additional material. Below we weave together a collection of documents that introduce tools for the data scientist—tools that are all part of the R Statistical Software Suite. Each module is a collection of one page sections that cover particular aspects of the topic. The modules aim to be a hands-on guide to a specific task that a new user can work through and then used as a reference guide. Each page aims to be a bite sized chunk for hands-on learning, building on what has gone before. Many modules also have a lecture pack and a laboratory session where a number of tasks can be completed. The R code sitting behind each chapter is also provided and can easily be run standalone to replicate the material presented in the chapter. The material begins with an overview of how an organisation should go about setting up their Analytics capability and then introduce the Data Scientist to R.
The material here is in various stages of completeness and is always under development! Chapters will change (improve) regularly. All of the material is provided under a Creative Commons Attribution-NonCommercial-ShareAlike 4.0 International License allowing access to everyone for any purpose (except commercial) and is provided at no cost. Refer to the Data Mining Survival Guide or my book on Data Mining with Rattle and R: The Art of Excavating Data for Knowledge Discovery (Use R) for related material. The data used across the chapters is available for download as data.zip. My book, The Essentials of Data Science: Knowledge Discovery Through R, introduces the concept of templates for supporting the data scientist. Below are a variety of templates covering different tasks. The data.R and model.R scripts collect together all of the other component scripts.